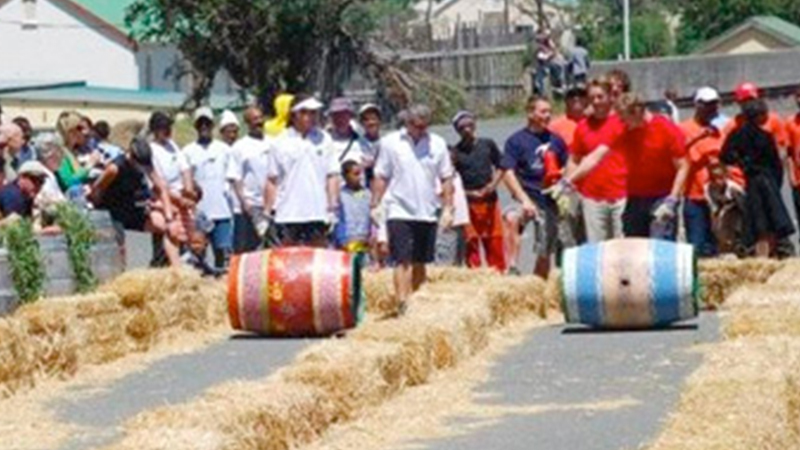 The wineries of Bot River held a barrel-rolling competition on Saturday at the square next to the Shuntin Shed. The main aim was to raise money for the Bot River educational fund for improvement on projects for Bot River, but the pleasure of beating all competition was a strong secondary aim. Anyone was allowed to enter and more than 24 teams participated. There was a lovely farmer’s market, food, live music, prizes and (of course) lots of wine.This was the second annual barrel race along with a mountain bike and a fun run and walk. After the tiring exercise and sunny conditions the prize giving held with great prizes such as wine hampers and even a real barrel up for grabs. Afterwards the crowds were looking for a bit of shade and enjoyed the rugby final on the big screen at the Shuntin Shed. Gabriel’s kloof was the overall winner while the team from Shannon clocked the fastest time of the day! Pictures of the race under gallery!